Measurements of high angles precise and accurate measurements long distance, supported for a quick and perfect systems Automatic aims at the prism. You will work faster, more rigorously and under less pressure. Intuitive interface, powerful database routines and programs loaded in total station: simplicity and identical in TPS and GPS. Configure and program the TPS1200 as you wish, for their applications, and export the infomation needed. TPS1200 total stations cover a range of models and options. Select the ones that suit you best. 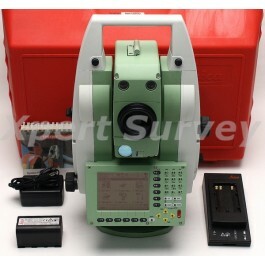 Use TPS1200 total stations for surveying, engineering, stakeout, topo, monitoring etc. Combine them with GNSS. Benefit from huge productivity of System 1200. PowerSearch finds reflectors within seconds no matter where they are. With PowerSearch activated, TPS1200 rotates and sends out a vertical laser fan. As soon as the fan strikes a prism TPS1200 stops rotating, ATR takes over and fine points – all fully automatically.